Panasonic Lumix DMC-GH2 is capable of recording Full HD 1080/24p and 1080i videos. For the 1080/24p video, you can choose high quality (24H) with 24Mbps or low quality (24L) with 17Mbps. While you can find Panasonic Lumix DMC-GH2 in the supported camera list of iMovie, you may notice that there is note saying there is issue about jittery playback of the footage filmed in digital cinema mode. The solution is not to edit the 24p clips to iMovie. If you face the dilemma and want to find workaround to fix the jittery playback problem of GH2 1080 24p AVCHD footage in iMovie, Aunsoft MTS/M2TS Converter for Mac is the recommended 24p AVCHD to iMovie converter for you to easily edit the recorded videos from GH2 in iMovie with smooth playback. It will convert 1080/24p AVCHD MTS/M2TS to 1080/24p MOV, and even keep 24Mbps or 17Mbps to output QuickTime .mov. 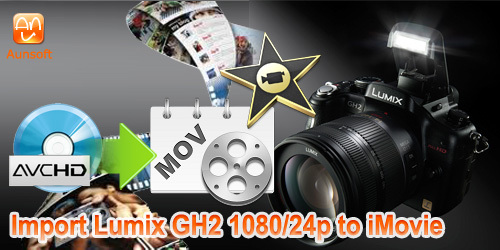 Below is the fast guide for you to import Lumix GH2 1080/24p AVCHD to iMovie on Mac for editing. Step 1. 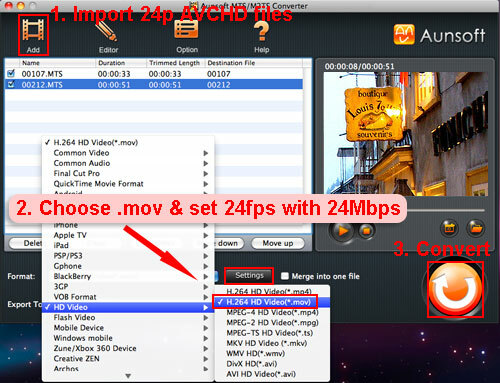 Import GH2 24p footage to Aunsoft MTS/M2TS Converter for Mac. Connect Lumix GH2 to Mac computer, run Aunsoft MTS/M2TS Converter for Mac as the best 24p AVCHD to iMovie converter on Mac. Click the "Add" button to import the .mts or .m2ts files from the DSLR camera. Step 2. Choose HD MOV format with custom bit rate. Click the "Format" option, and navigate to HD Video > H.264 HD Video(*.mov) as output format. Click the "Settings" button and enter 24000 or 17000 as the bit rate for 24Mbps or 17Mbps. You may also set the frame rate to 24fps. Step 3. Convert 24p AVCHD files to MOV for iMovie. Click the convert button under the preview window, and the 24p AVCHD MTS/M2TS converter will start converting 1080 24p files from Lumix GH2 to 24fps MOV with 24Mbps, keeping high bit rate and HD resolution. After the conversion, you can play the recorded videos without problem in iMovie and make accurate editing. How to Convert Sony M2TS Files to iMovie for Mac?